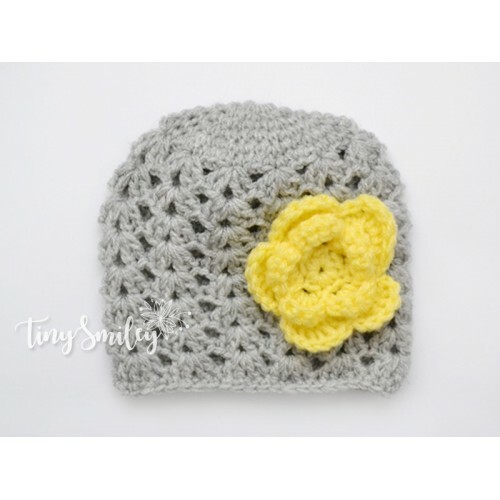 Baby Hat Crochet Baby Girl Hat Gray Baby Hat Newborn Girl Hat Hospital Hat Infant Girl Hats Flower Baby Hat Baby Girl Outfit is perfect for a gift, your baby’s first photos or just to keep your little one warm. Made with soft and non-allergenic baby acrylic yarn. The baby hat is available in a variety of color combos. Please choose your colors during checkout, otherwise the hat will be sent with the same colors as in the main picture. 0 to 3 months - up to 14"
3 to 6 months - 14.5 - 15"
All items are created in a smoke and pets free house. CARE INSTRUCTION: gently hand wash in cool water with mild soap and lay flat to dry. Request a custom order with the desired modifications and with the product code you see above or have something made just for you. Hi and welcome to Tiny Smiley, your go-to online marketplace for handmade and customized items for your sweet bundles of joy. All of the items you receive from Tiny Smiley are both smoke free and pet free to ensure that your baby is not irritated in any way while wearing our products. Learn more from here.